Black Diamond Legend Gloves. Black Diamond's pro-grade ski glove built with an unparalleled fit and the best materials available, the Legend offers protection, warmth and dexterity that are worthy of its name. 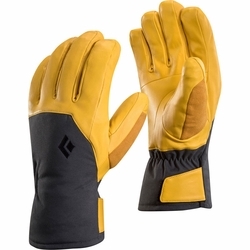 Built for snow professionals, ski guides and dedicated skiers who want unparalleled fit, protection and dexterity, the Black Diamond Legend Gloves are designed for those who click in every day of the season. Featuring the waterproof and breathable protection of GORE-TEX to seal out wet conditions, 170 g PrimaLoft Gold insulation to insulate against bitter winter temps, and a buttery-soft fleece lining for a soft, cozy feel, the Legend combines protection with comfort like never before. Updated 3D patterning gives the Legend more dexterity than ever before, and the supple yet durable sheep leather fingers and palm allow for dramatically improved feel. The abrasion-resistant Pertex shell shrugs off moisture and scrappy terrain, and a hook-and-loop wrist closure seals out the elements.